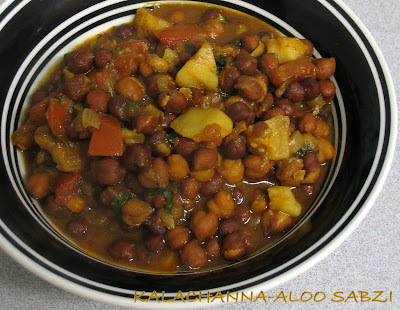 Soak kalachanna overnight. Pressure cook the channas for 5-6 whistles. Meanwhile boil,peel and chop the potatoes. Heat oil in a pan and add chopped onions. Saute until translucent. Add tomatoes,salt,tumeric powder,garam masala powder. Saute until mushy and oil separates. Mix well cooked channa and potatoes. Boil for 8-10 mins. Serve with idiyappams or rotis. I love this combo, especially with puris ~ looks mouthwateringly delicious!